Ramesh Kumar passed his PMP exam earlier this week. He has shared his lessons learned and some very useful tips to help his fellow project managers achieve their PMP certification. I passed PMP Exam on Mar 17, 2010. Below, I am sharing my experience. I felt the questions I got are simpler than most of the questions that I had practiced. I did not find any lengthy situational questions that will let you swirl around in the question for a long time. Another interesting thing that I noticed is that, I don’t remember having seen any questions with the tag EXCEPT or NOT. I got a few containing the BEST though. Got a few questions on EVM (simple ones though)and many questions on ITTOs (So, don't neglect them). Even before I attended my classroom training (as my motivation levels are at the peak), I did try to go through the PMBOK, but I always dozed off without going any further. Then, I went through the Head First PMP, which helped me in aligning my real time experiences with the bookish terms. That has really helped me in going through the classroom sessions without much difficulty. I completed my classroom course in August and the initial estimate to clear the exam was by the end of October. But my priorities kept changing and I kept on postponing the exam date accordingly. Finally I decided to not delay it any further and set a deadline of Mar 10th (Though I slipped it again by a week). As I regrouped my self again in the first week of Feb, I went through the following books in that order. Rita’s PMP Exam prep – I felt the book is a little less boring than PMBOK, but not the one that I recommend first up. I liked the first chapter containing the PMI-ism’s though. KIM Heldman’s PMP Study Guide – A completely different approach from Head First and Rita. Went through the PMBOK in the last week after my initial failure to go through even a single chapter. This time, the book made a lot more sense. 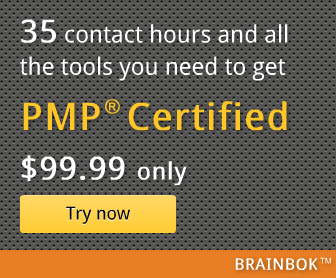 PM Study – As good as the real exam. Free test from www.edwel.com - You need to register yourself first. Though there are a few questions repeated, there are some very good questions, that will let your brain do some work. Question bank from the Kim’s CD that comes along with the book. Though it does not contain the full 200 question test, the quality of the questions is excellent. Most of the questions are long enough along with their answers. If you manage to get even close to 65% in those questions, you would be doing a good job in the final exam. All the questions in the Rita’s book. All of them are excellent questions again. Last but not the least, I went through the complete question bank given to me by my trainer (SABCONS, Bangalore). The quality of the questions there are as good as one can expect. Is a regular visitor on the Harwinder’s blog www.deepfriedbrainproject.com and Josh’s www.PMStudent.com. Though I rarely replied to any of the posts, these two sites have helped me immensely in my personal development. The exam date was never a problem in Bangalore (You may not find a date for the coming month, but you will definitely find one in the coming week). So, fix a date and go according to the plan. I wish all the aspirants all the best.